Cape Fear Ocean Friendly Gardens Program: capturing runoff and engaging local youth. 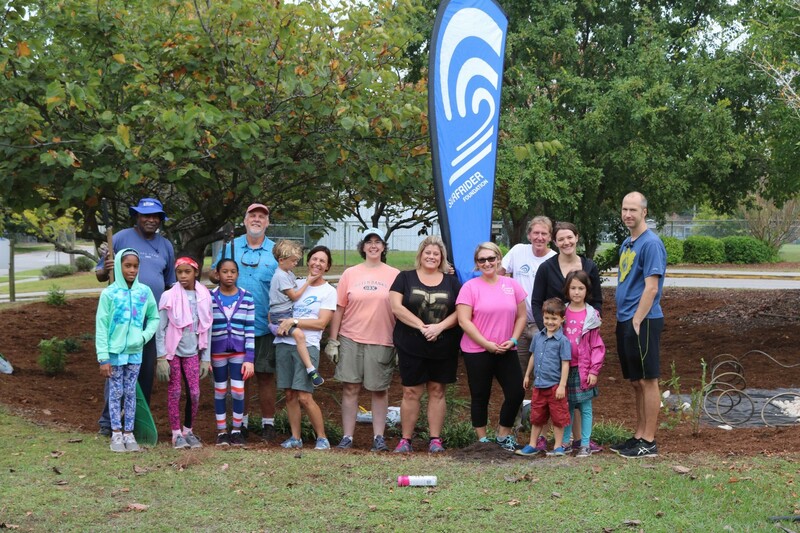 As part of their ongoing mission to mitigate surface water run off pollution through the use of Ocean Friendly Gardens, the Cape Fear Surfrider Chapter recently completed two projects in Wilmington, NC. Both projects met the chapter’s goal of creating OFGs while connecting the concept to the education system through community outreach. Gregory Elementary. 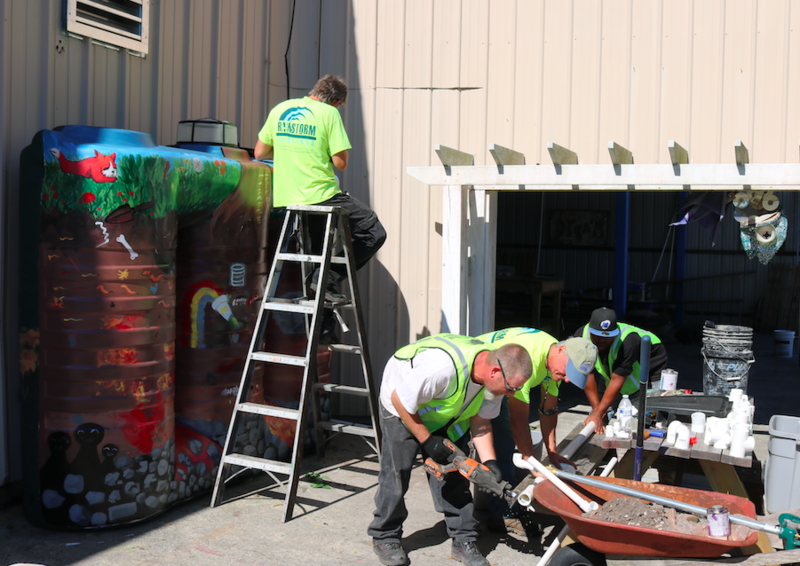 The chapter helped this inner city, Title I magnet school in Wilmington rehabilitate an existing rain garden which captures runoff from a 20,000 square foot parking lot. The original rain garden had been constructed years ago with state grant funding but had not been properly maintained, and it wasn’t functioning properly. 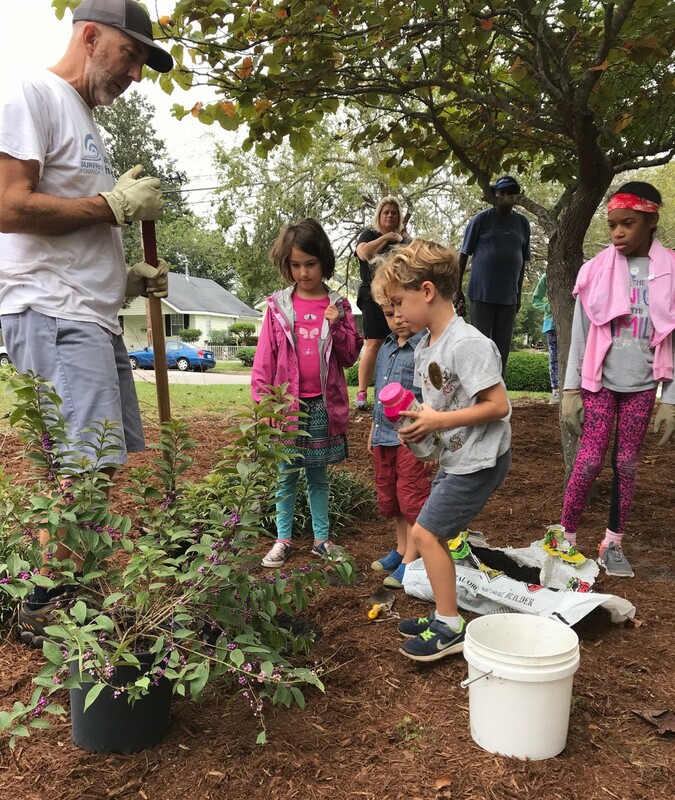 The Chapter arranged an incredibly productive workday, and with the help of runoff capture experts, Rain Storm Solutions, Gregory Elementary PTA and a group of 20 volunteers the rain garden was revived. First the compacted soil and debris was removed from the garden and a spillway using impermeable fabric and river rocks was created. The volunteers then mulched, pruned the existing trees and planted new native plants. The garden is now a beautiful example of how we can maintain our garden to capture rainwater, allowing water to soak into the ground, and prevent stormwater runoff from occurring. This system, along with the existing rain garden on-site (also rehabbed by Rainstorm) that captures run off from the parking lot, is a great example of how everyone can help reduce runoff. Polluted stormwater runoff is the largest sources of water pollution in North Carolina and also the number #1 reason why swim advisories and closures occur at beaches across the country. By making our yards more ocean friendly, allowing water to soak into the ground, we are not only conserving water but also supporting clean water in our local waterways and down at the beach.